Think of a number from 0 to 63. Then, on your piece of paper, circle the cards that contain your number. For example, if your number is 15, you’ll need to circle the card in the upper-left because 15 is on that card. You’d have to circle all the cards that contain 15. Is everyone done? (Points to someone) Which cards did you circle? At this point, the audience member will say something like “Top left, top middle, and bottom right.” Then I will add the smallest numbers on each card (in this case, 1, 2, and 32) and answer in five seconds or less, “Your number was 35 (or whatever the sum is).” It turns out that the number is always the sum of the smallest numbers on the selected cards.As shown in yesterday’s post, this is a consequence of the binary representation of whole numbers (as opposed to the ordinary decimal representation). Though I don’t do this in my magic routine for the sake of time, I have challenged my future high school math teachers to develop a similar magic trick for some other base, like base 3, just to make sure that they really understand the concept behind the above magic trick. 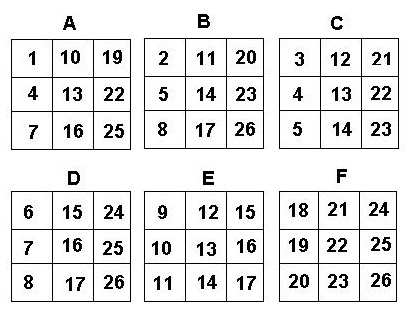 Here are the cards that work for base 3 (taken from http://www.mathman.biz/html/sherimagic.html). I encourage the reader to develop another set of cards for base 5. It will require 10 cards for numbers from 1 to 24. With tomorrow’s post, I’ll continue my description of my magic routine.